A staple gun is the most powerful and handy tool that works to drive metal staples into Food Truck the target material. The most common purposes with a staple gun include fastening materials onto plastic, wood, and masonry. In other simple words, staple guns are the more prominent, powerful and faster version of staplers that most of us use in the office. Today we will expose some common problems that usually individuals face with the staple gun and will provide ideal approaches to fix them. Clogged hammer is one of the most common problems that you may encounter with a staple gun. The main reason or root cause of this problem is using "inappropriate staple sizes." If you will not use the right size staples with your staple gun, clogged hammer issue is likely to arise. To fix the issue, first of all, make sure whether you've inserted right size of staples into your staple gun or not. If you've used small or too big sized staples than the recommended staple size for your staple gun, you need to open the staple gun to check the hammer by exerting some force on the stapler head. The hammer must be able to slide down without any interruption. You can dislodge most of the obstructions easily with a screwdriver. However, if your hammer is clogged by dirt, grease or gunk, applying degreaser like vinegar or WD 40 will surely do magic here. Also, you can add lubricant on the hammer to ensure the ease of tension and make your staple gun work more smoothly. 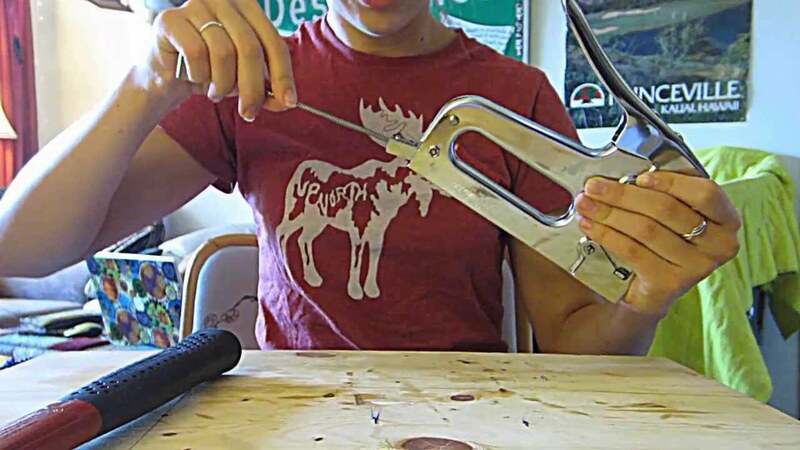 If spring of your staple gun will not be able to manage enough tension, probably your staple gun will not be able to generate enough force to fire staples continuously. To check whether the spring of your staple can maintain enough tension or not, open the staple gun, and then slide the spring and leave. Probably, the spring will immediately come in contact with the bars of staples. However, if you find the spring is reacting very slow, it’s the sign that you need to buy a new staple gun. Whether you own a manual staple gun, electric staple gun or pneumatic staple gun, jamming is the most common problem that you will inevitably encounter at some stage after repetitive use. Fixing this issue is really effortless. Just open your staple releasing head using a screwdriver and pull out the staple clip that's in excellent condition and store somewhere safe. Now the main idea is to pull out the jammed staple. You can use Needle-nosed pliers here to hold and pull out the jammed staple. Once you remove the jammed staple out of the system, insert the staple clip that you've safely removed earlier. That's it. Now power on your staple gun, I'm sure it will be jam-free now and will offer smooth performance. Note: Don't forget to remove power source while opening the staple gun. It’s mandatory that you obliterate power sources before you open the device. Doing so will avoid unwanted accidents and ensure the safety. So these are some of the most common problems associated with staple guns that most of the owners face. Hope the tips help you to bring back your staple gun in working condition.